Dario Franchitti admits his 2012 IndyCar campaign was 'painful' at times, as his run of titles came to an abrupt end. The Scot had won the past four IndyCar championships he had contested - earning the 2007 crown with Andretti-Green before an unsuccessful NASCAR attempt in '08. 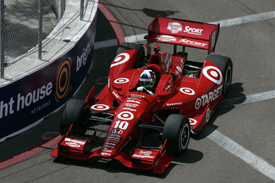 He was then tempted back to IndyCar by Ganassi and claimed the title hat-trick from 2009-11. But this season Franchitti could only manage seventh in the standings as he struggled to adapt to the new Dallara DW12 chassis at first. 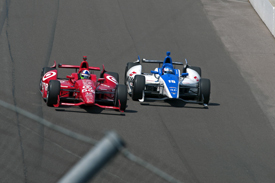 "There were times when it was pretty painful," Franchitti wrote in a column for the official IndyCar website. "Early on, it was very painful - just getting the car to do what we needed it to do and me learning how to drive the car the way I needed to drive it. "Then we figured it out, and just one thing happened after another. "That happens in racing. You get the ebb and flow." Franchitti's Indianapolis 500 victory was his only triumph of the year - though he felt that outweighed a lot of the disappointments. "If you think about Indy and what Indy means to me, to the team and most teams and drivers, we see it as important as the rest of the season. So when you can win it, it's great," he said. "Any year and any time you can win at Indy is fabulous. That was a great Month of May. [Team owner] Chip [Ganassi] always tells us at the start of the year that's there's two goals - to win Indy and to win the championship. So we accomplished one goal." He also took comfort from his average qualifying position of 6.5 during the year. "The good news is I think the pace was there," said Franchitti. "We had one of our best qualifying averages for years, and I'm pretty happy about that. We just need to turn it into results." LOW: Title defence starts with disappointment - 13th in St Petersburg as he struggles to adapt to the new DW12. HIGH: Takes his first – and only – win of the year at the Indianapolis 500 from 16th on the grid, after a dramatic final lap battle with Takuma Sato. LOW: Starts from second at Texas but an unscheduled pitstop during the first stint sees him finish 13th, three laps down. LOW: ...but is classified only 19th, 25th, 17th and sixth in the races. Fails to even take the start at Iowa after his engine blows on the pace car lap.